WARSAW, Poland, November 12, 2013 (ENS) – Seasoned climate negotiators from around the world were moved to tears as Naderev “Yeb” Saño, head of the Philippines delegation, made an emotional statement to the UN Climate Change Conference on the disaster in his country caused by Typhoon Haiyan on the weekend. Sano pleaded with government negotiators to take notice of the devastation in the Philippines as they make their decisions over the coming 10 days about how much they can do to avert the worst consequences of climate change. Sano announced that he would not eat until delegates made meaningful progress, mounting a hunger strike in solidarity with the victims of Typhoon Haiyan, known locally as Yolanda. He called on delegates at Warsaw National Stadium to make the connection between climate change and the increase in severe storms, rising sea levels, floods and drought. He urged them to be the ones who inspire their countries to move the world out of the climate danger zone. “To anyone who continues to deny the reality that is climate change, I dare you to get off your ivory tower and away from the comfort of your armchair,” Sano urged. “I dare you to go to the islands of the Pacific, the islands of the Caribbean and the islands of the Indian ocean and see the impacts of rising sea levels; to the mountainous regions of the Himalayas and the Andes to see communities confronting glacial floods, to the Arctic where communities grapple with the fast dwindling polar ice caps, to the large deltas of the Mekong, the Ganges, the Amazon, and the Nile where lives and livelihoods are drowned, to the hills of Central America that confronts similar monstrous hurricanes, to the vast savannas of Africa where climate change has likewise become a matter of life and death as food and water becomes scarce,” he said. “Not to forget the massive hurricanes in the Gulf of Mexico and the eastern seaboard of North America. And if that is not enough, you may want to pay a visit to the Philippines right now,” said Sano. Sano told fellow negotiators of his brother, who has spent the last three days pulling dead bodies from the typhoon debris and is hungry because the supplies have been cut off from his island. Sano said he would take part in a voluntary hunger strike in solidarity with his brother and others going hungry in the Philippines, to call governments to account and push them to deliver commitments in Warsaw. In what he described as a sad “twist of fate,” Sano’s speech echoed his remarks at the COP18 conference in Doha, Qatar last year, as Typhoon Bohpa hit his country, leaving 1,000 dead and hundreds homeless. “It was barely 11 months ago in Doha when my delegation appealed to the world … to open our eyes to the stark reality that we face … as then we confronted a catastrophic storm that resulted in the costliest disaster in Philippine history,” Sano told his fellow delegates. “Less than a year hence we cannot imagine that a disaster much bigger would come. With an apparent cruel twist of fate, my country is being tested by this hellstorm called Super Typhoon Haiyan, which has been described by experts as the strongest typhoon that has ever made landfall in the course of recorded human history,” he said. 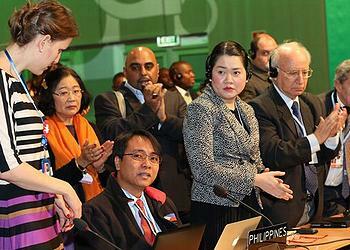 Sano called on governments at the conference to confront the issue of loss and damage. Delegates are debating this mechanism that would help compensate vulnerable countries for the unavoidable impacts of climate change. The Warsaw climate conference is negotiating for a new legally-binding climate change agreement that covers all countries. It will be adopted in 2015 in Paris and implemented from 2020. Sano warned that developed country emission reduction targets are “dangerously low.” He pleaded for all countries at all levels of development to join together to tackle climate change and ensure sustainable development. This requires “global solidarity,” he told the international audience. Delegates gave Sano’s speech a standing ovation. China’s delegation then called for a three-minute silence in the plenary hall to honor the memory of all those who lost their lives in the typhoon, including dozens in China and Vietnam. Super Typhoon Haiyan/Yolanda, which hit the Philippines on November 8, has been recognized as the strongest tropical cyclone to make landfall in modern history, spanning over 600 kilometers (400 miles) and packing winds of 315 kilometers per hour and gusts of up to 380 km/h. As of Monday, the typhoon had caused at least 1,774 deaths. An estimated 615,770 people have been displaced and an estimated 9.7 million people are affected. The storm damaged or destroyed some 23,200 houses, as well as public infrastructure and agricultural land, across 41 provinces, according to the National Disaster Risk Reduction and Management Council. However, local officials project that the super typhoon killed an estimated 10,000 people in Leyte Province alone, where storm surges reached 13 feet and sustained winds surpassed 175 miles per hour. Now, two days later, another typhoon has struck the Philippines. Not as severe a storm as Haiyan/Yolanda, Typhoon Zoraida made landfall at 4:00 am on Monday as a Tropical Depression over Davao Oriental, a province on the southern island of Mindanao.